Though he is most well known for his sculptures incorporating fragments of crushed automobiles, John Chamberlain is also a highly accomplished graphic artist. 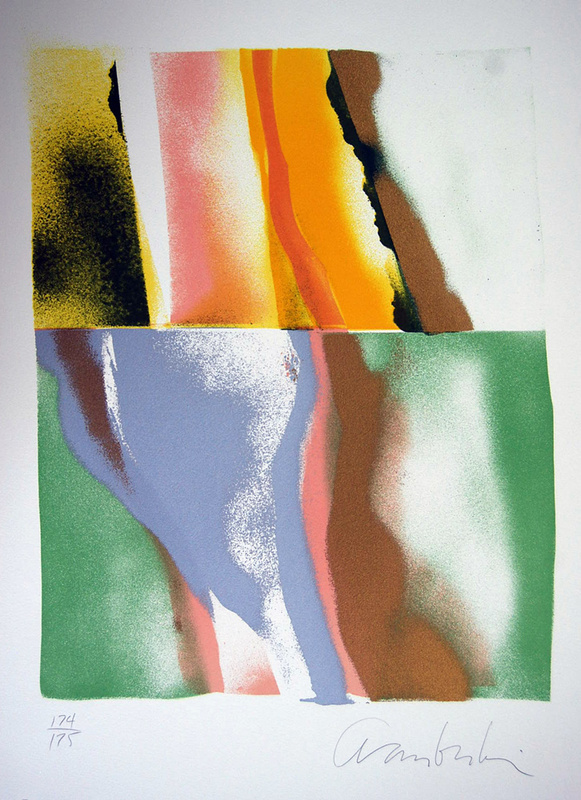 These prints translate the artist’s ability to merge color and abstract form into dynamic interesting prints which capture the feeling of his sculptural works. Born in 1927 in Rochester, Indiana, John Chamberlain grew up in Chicago. After serving in the United States Navy from 1943 to 1946, he attended the Art Institute of Chicago (1951–52) and Black Mountain College (1955–56). Chamberlain moved to New York in 1956 and the following year made Shortstop, his first sculpture incorporating automobile parts. His work was included in the “Art of Assemblage” exhibition at the Museum of Modern Art, New York, in 1961, and he began showing at Leo Castelli’s New York gallery in 1962. Chamberlain had his first retrospective in 1971, at the Solomon R. Guggenheim Museum, New York, and the Museum of Contemporary Art, Los Angeles, held a second retrospective in 1986. He currently lives and works on Shelter Island, New York. Chamberlain’s work was widely acclaimed in the early 1960s. His sculpture was included in The Art of Assemblage at the Museum of Modern Art, New York, in 1961, and the same year he participated in the Såo Paulo Bienal. From 1962, Chamberlain showed frequently at the Leo Castelli Gallery, New York, and in 1964 his work was exhibited at the Venice Biennale. While he continued to make sculpture from auto parts, Chamberlain also experimented with other mediums. From 1963 to 1965, he made geometric paintings with sprayed automobile paint. In 1966, the same year he received the first of two fellowships from the John Simon Guggenheim Memorial Foundation, he began a series of sculptures of rolled, folded, and tied urethane foam. These were followed in 1970 by sculptures of melted or crushed metal and heat-crumpled Plexiglas. Chamberlain’s work was presented in a retrospective at the Solomon R. Guggenheim Museum, New York, in 1971. In the early 1970s, Chamberlain began once more to make large works from automobile parts. Until the mid-1970s, the artist assembled these auto sculptures on the ranch of collector Stanley Marsh in Amarillo, Texas. These works were shown in the sculpture garden at the Dag Hammarskjï¿½ld Plaza, New York, in 1973 and at the Contemporary Arts Museum, Houston, in 1975. In 1977, Chamberlain began experimenting with photography taken with a panoramic Wide-lux camera. His next major retrospective was held at the Museum of Contemporary Art, Los Angeles, in 1986; the museum simultaneously copublished John Chamberlain: A Catalogue Raisonné of the Sculpture 1954–1985, authored by Julie Sylvester. In 1993, Chamberlain received both the Skowhegan Medal for Sculpture and the Lifetime Achievement Award in Contemporary Sculpture from the International Sculpture Center, Washington, D.C. The artist has lived and worked in Sarasota, Florida, since 1980. John Chamberlain: A Retrospective Exhibition. Ed. Diane Waldman. New York: Solomon R. Guggenheim Museum, 1971. Interviews by Elizabeth C. Baker, Donald Judd, and Diane Waldman. •John Chamberlain: Reliefs, 1960–1982. Sarasota, Fla.: The John and Mable Ringling Museum of Art, 1983. Text and interview by Michael Auping. •John Chamberlain: A Catalogue Raisonné of the Sculpture, 1954–1985. Ed. Julie Sylvester. New York: Hudson Hills Press, in association with The Museum of Contemporary Art, Los Angeles, 1986. Text by Klaus Kertess. •John Chamberlain: Gondolas and Dooms Day Flotilla. New York: Dia Center for the Arts, 1991. Interviews by Julie Sylvester and Lawrence Weiner. •John Chamberlain. Baden-Baden: Staatliche Kunsthalle, in association with Cantz, Ostfildern, 1991. Texts by Angelika Beckmann, John Chamberlain, Donald Judd, and Jochen Poetter. •DeKooning, Chamberlain: Influence and Transformation. New York: PaceWildenstein, 2001. Text by Bernice Rose.